I almost posted "Bonnie Kickstarter BEINGS now" because that's how caffeinated/psyched I am for it! And really, I am 100% a Bonnie Kickstarter Being. ANYWAY. I've created my FIRST EVER Kickstarter in order to get a collected Bonnie Volume 1 printed up, so check it and all the rewards and the video with my (awkward) voice and everything over on the Kickstarter page! Love you guys and all the support over all these years I've been doing Bonnie! Wait, that sounds like I'm ending it - I'm NOT ENDING BONNIE, SHE WILL BE MY FRIEND FOREVER! Woo hoo! Now that my new website is all up and running (of course, you should ignore the bits that are still blank - what, did you expect this to be a COMPLETE site or something?? ), it's funny to be posting a blog post here about the fact that there's a new Bonnie here! But here's a link to where you can find Bonnie now, in case you don't feel like searching. 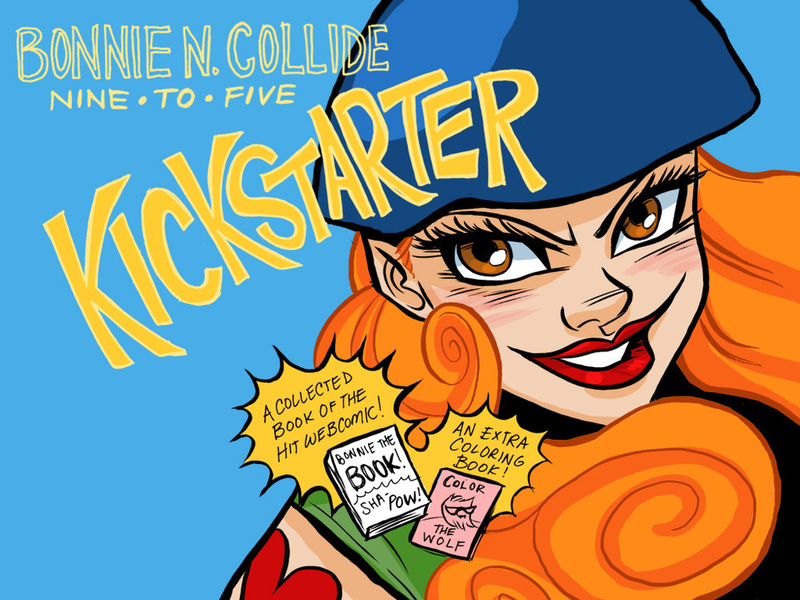 New Bonnie N. Collide Strip! Make-up is TOTALLY where it's at. Bonnie N. Collide - 100 strips! Hurrah, 100 strips of Bonnie N. Collide, Nine to Five! Click here to read the latest, and also to check out my very first sketch of Bonnie! Woo! 99 strips done! You may be asking why it's not 112, like it says on my site page. That's because I'm counting the ones that just I did, not taking credit for the gorgeous Tim Fish strips. Which you can read starting here! I also wanted to let you guys know that since I'm (still) in the process of revamping my whole website, once that's complete I'll be adding an archives page and a character page to this strip. I know not having an archive page has been a headache for some of you guys, so thanks for your patience with me! I promise it'll be worth the wait! Last weekend I was commissioned by some friends/fellow Charm City Roller Girls alums/Night Terrors to create a derby portrait for the magnificent PAIGE FAULT, who is sadly moving out of our fair city of Baltimore .... *sniff sniff*. I love doing derby portraits, and this one was especially fun - not just because I know/love Paige, but I also know her penchant for all things ridiculously cute. If any of you out there are interested in a derby portrait, give me a holler! I posted a new comic update last night that was rife with problems so I didn't say anything ... here it is now! Bonnie N. Collide update! With comments! And to celebrate, I've decided to add a comments box! Yes, I'm finally now doing what others have been doing with their comics for YEARS.